Next 3 Dec. 2017, one year after its last show, the Supermoon will be back again in the sky, being the only one visible in 2017. On that day, our beautiful Moon will be full while close to its perigee (its minimum distance from the Earth, which will be reached on 4 Dec., at 357.495 km from us, compared to an average distance of about 384.000 km), then it will be a little closer, brighter and apparently bigger than usual. The 14 Nov. 2016 Supermoon sets behind St. Peter’s Dome. 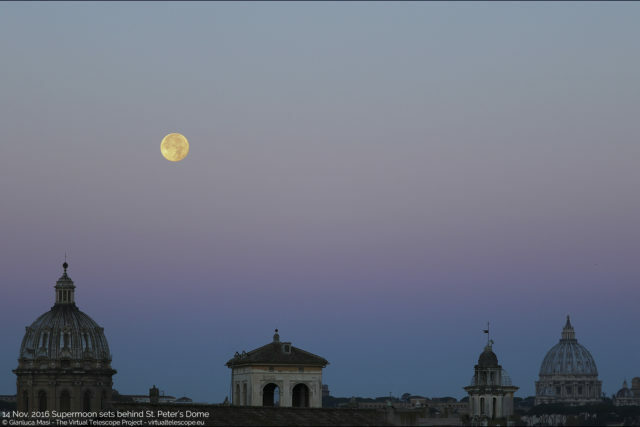 – La “Superluna” del 14 novembre 2016 tramonta dietro la Cupola di S. Pietro. NB: versione in italiano qui! This condition is now popularly referred to as Supermoon. The term itself is of no scientific value: astronomers prefer to call it perigee full Moon, but undoubtedly Supermoon is by far a much more charming name. 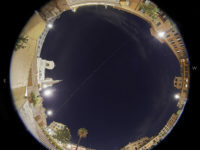 Both the full and the new Moon can be “super”, as long as they occur near the lunar perigee, that is, when our satellite is at its minimum distance from the Earth. 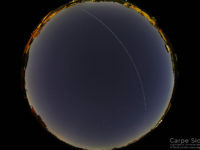 The Moon moves around our planet along an elliptical orbit, so its distance from us is not constant, but varies between a minimum (perigee) and a maximum value (apogee). Of course, the new Moon is not visible in the sky, so only the full Supermoon can be observed (unless we have a solar eclipse during the new Supermoon, as in March 2016). In 2017, we had a total of four Supermoons, but the only full and visible one will be the next 3 Dec. one, ending the 2017 cycle. Apparent size of the 3 Dec. 2017 “Supermoon” (left) vs average full Moon (right): the Supermoon is about 7% larger. 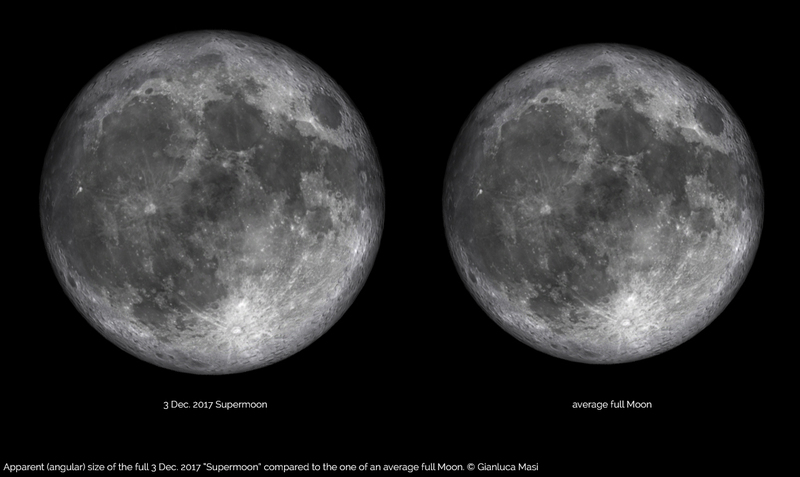 – Dimensioni apparenti della Superluna del 3 dicembre 2017 (a sinistra) rispetto a quelle di una normale luna Piena (a destra): la “Superluna” appare circa il 7% più grande. 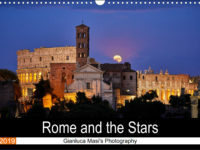 “At night,” continues Masi, “the full Moon is very bright, almost dazzling, compared to the darkness of the landscape.” “At its rise”, adds astrophysicist Gianluca Masi, ” the Moon appears behind monuments and elements of the landscape, generating the feeling that its disk is larger than usual, but this is just an optical illusion, due to the presence of those terrestrial elements on the line of sight, giving grounds for comparison”. 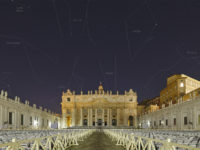 The Virtual Telescope, thanks to its roving instruments, will show the next 3 Dec. Supermoon while it will rise above the legendary skyline of Rome, behind the most famous monuments of the Eternal City, with commentary by astrophysicist Gianluca Masi, sharing the experience with curious people from all around the world. 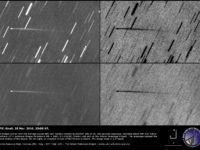 23 Dec. 2015, the Moon occults Aldebaran: how to see it? 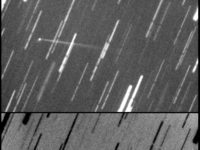 Previous story The unique asteroid 3200 Phaethon: bright 2017 apparition – see it online!